It's bed time... you go upstairs to the bedroom with your child and watch or help as he/she gets ready for bed. Once they are nestled in, a typical next step is a bedtime story. But how often have you told a story? Not read a story, but TOLD one from memory? It's an interesting question and points to a fact that we have as a culture lost a significant amount of the "oral tradition" that dates back to the dawn of history. People have always told stories. In words, songs, poems, etc. It was long the role of the bard, the troubadour, the storyteller to relay those stories and tell the tales. It was that way for hundreds and perhaps thousands of years. With the invention of the printing press, though, we started to write down those stories and capture them in "books". And that is a truly wonderful thing because it preserved so many of the stories that might otherwise have been lost to the ages. But the other side of it is that it seems to me that in general we no longer tell but instead read stories. I was certainly this way. "Pick out a book", I said to our daughters, "and I'll read it to you." And so I did and continue to do so to this day. But I have also injected telling the occasional story. 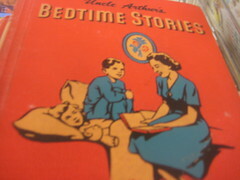 Just starting with basic timeless stories like "The Princess and the Frog", "Goldilocks", "Little Red Riding Hood", etc. It's been an interesting experiment, really. Partly to see if I can actually remember them (I can) and partly in how you express the story and make it fun and interesting. I have to say it's turned out to be something rather fun to do... and has been much enjoyed by our daughters. When was the last time YOU told a story? To kids? To family? To friends? To an audience? May 2010 marks my tenth year of blogging across the various sites I have, yet 2009 was a challenging year for my writing. Sure, I wrote many posts here, on Disruptive Telephony, on Voxeo's weblogs and other places. But nowhere near the number of posts I wanted to write - and not with the regularity I desired. My queue of post ideas is up in the hundreds at this point... and as usual I wake up each morning with my head exploding with stories to tell. Now, 2009 did have some unusual challenges for me personally. For starters, at the beginning of March, I took on a new role at Voxeo heading up all of our external communications. No longer was I just our "lead blogger", but now I also had responsibility for all marketing, PR, analyst relations, collateral, trade shows / events and everything else in "communications". Plus I now had a team of 4.5 people scattered across two continents. There was admittedly a good bit of a learning curve on all the broader pieces of how we were telling our story, how to bring that all together into a cohesive plan, and how to work with a new team. The second factor was that in late April, our second daughter entered the world bringing with her all that glorious joy... as well as all the intense sleep deprivation... these two factors together meant that making time for writing (and being able to do so coherently!) was challenging at best. But as 2010 dawns, the story is different. Sure, it's shaping up to be an absolutely crazy-busy year at Voxeo with all the great work we have underway, but I've got an outstanding (and growing) team and we're working together real well now... and the daughter? Well, at 8 months she's still not sleeping through the night all the time, but I'm either getting more sleep or just getting used to sleep deprivation. So my big personal goal for 2010 is to return to telling more stories... writing about the changes happening all around us... chronicling the revolution we are in the midst of ... in the ways and means through which we communicate... that is the story of our time... and I want to get back to doing my part in telling that story. So that's my list.... Write. Interact. Health. 2009 was a great year... 2010 looks even better... what are you going to do with this precious year? What are your three words? What if you have a set of slides that really needs audio to make sense? That all alone doesn't really work? That was the case with my "story of SysAdmin Steve" presentation that I did back at O'Reilly's Emerging Telephony conference earlier this year. A number of people commented that without the audio, it was hard to really know how it went. This was deliberate, really - there was a reason for me doing it that way. Press the green play button to begin. The first slide starts changing about 3:45 seconds into the show - and then they start changing at a rate averaging about once every 2-3 seconds. I tried as best I could to sync the slides to the audio... I may adjust it in some places (and the cool part is that you can adjust it!). Feedback is, as always, quite welcome. This was a fun presentation to do... and using SlideShare's slidecasting interface does let me relive a bit of that fun! Per adfreak, the video was a "Gold" winner at the Cannes Lions event.